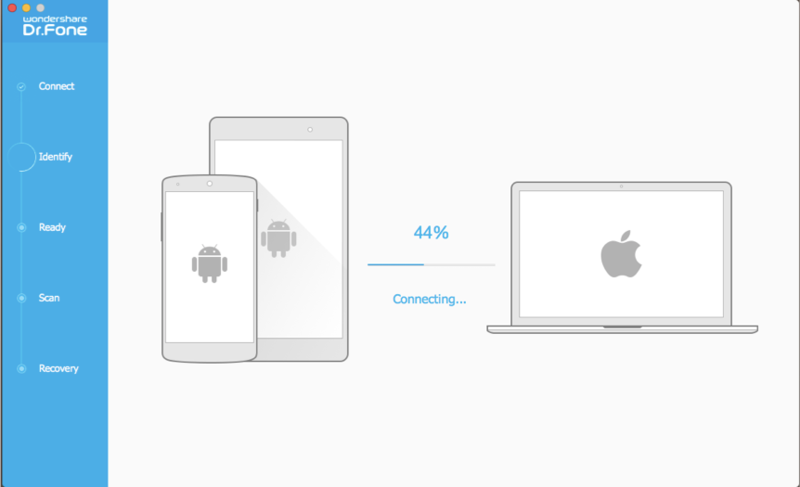 Wondershare’s Dr. Fone for Android (Mac): Bringing data back from the dead! If you are looking for an easy but powerful tool to recover the data that you had accidentally deleted from your Android phone, this is the right option for you. In our current Information age, data holds much more power and relevance than it ever had in the past. Adding to the role data has in our personal and professional lives, is the ever-increasing popularity of mobile Android devices, which has married the data we use to our individual identities. As such, it’s very important to manage and secure it properly. However, in the event of an occasional hiccup that erases your information, you have to look at simple, intuitive and effective tools that will help you recover the same. That’s where Wondershare’s Dr. Fone for Android comes in. 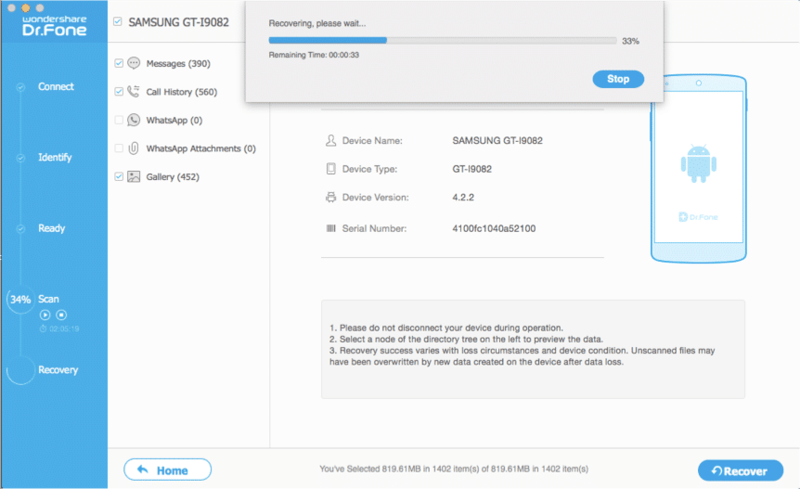 Dr. Fone for Android (Mac) is a superb application that makes clean data recovery accessible to anyone who owns a Mac and an Android device. The software also has a version that can be installed on a Windows system. If you include the superb Dr. Fone for iOS (Mac & Windows) as well, you need not go anywhere else for your data recovery needs. The trial version is free to try and the paid version can be obtained at the Wondershare Store through cheap flexible volume licensing options. To make your mind up, let’s dive deeper into the system requirements, features, and how exactly we go about using it. Dr. Fone scans and previews messages, contacts, videos, photos, songs, documents and even your Whatsapp history once you initiate the process. After that, bringing your data back from the dead is simply a matter of choosing what you want to recover from your Android device. From the device end, Dr. Fone supports over 2000 Android Device Models & various Android operating systems. 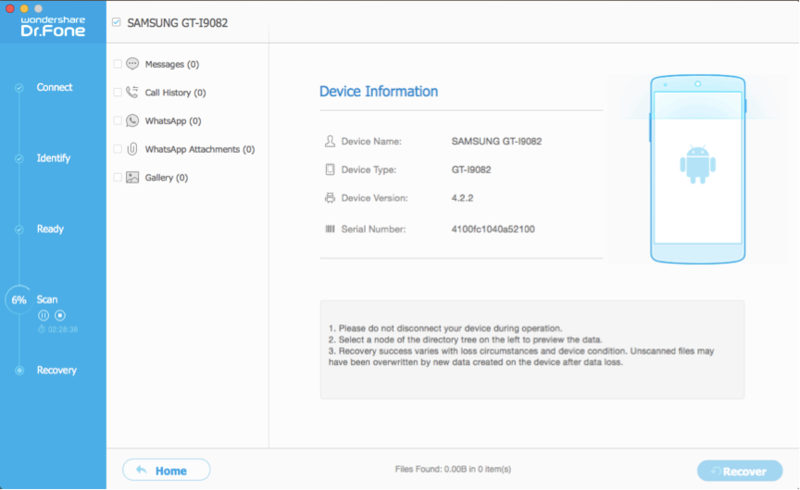 Even rooted Samsung devices are supported, regardless of the OS. Never to be complacent, the list of supported devices continues to grow. Using the program is easy for even a beginner, thanks to the beautifully intuitive step-by-step approach implemented in Dr. Fone. The tool also provides excellent support services. Web-site support and documentation is very easy to follow. Informed representatives are available on a 24/7 basis to assist you over live-chat or email. Wondershare’s upgrade policy (for almost all of its products) is very fair to the user as it provides free lifetime upgrades to all their registered customers. Encryption and advanced fraud protection of your personal data ensures that your experience with them is smooth and bereft of any loss. In spite of all the benefits the software provides, should you choose to revoke your license, Dr. Fone has got you covered by a 30-day money-back guarantee. After downloading Dr. Fone for Android from the mentioned link above, mount the .dmg file and install it into your Applications folder. Click the icon to launch it. You will be greeted by the screen above. If you have a registration code, go to (Wondershare Dr. Fone for Android) -> Preferences -> Register. Note that you cannot recover scanned files with a trial version. 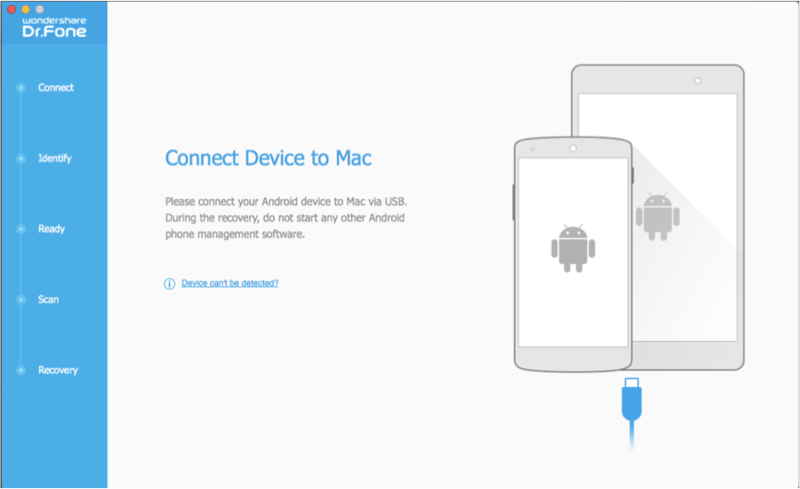 Connect your Android device to the laptop through a USB cable. 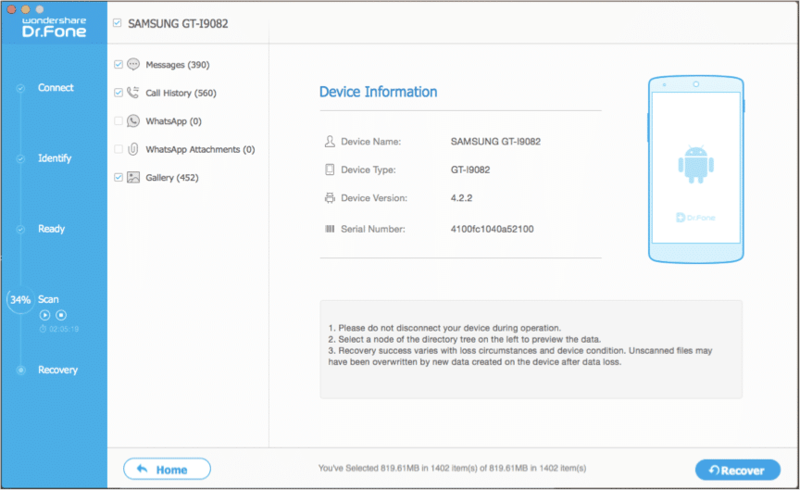 The program will detect the device automatically as long as your system detects the device. In the next screen (shown below), choose the type of files that you want to scan for and recover. After that, you need to select how the tool scans the storage media. 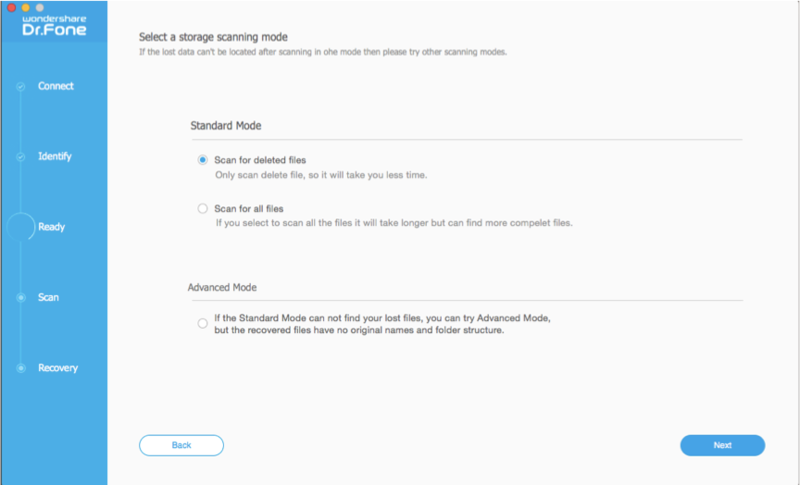 We recommend the default option of scanning for only deleted files. Now, ensure that your device has at least 20% of battery charge and press “Start” to initiate the scanning process. 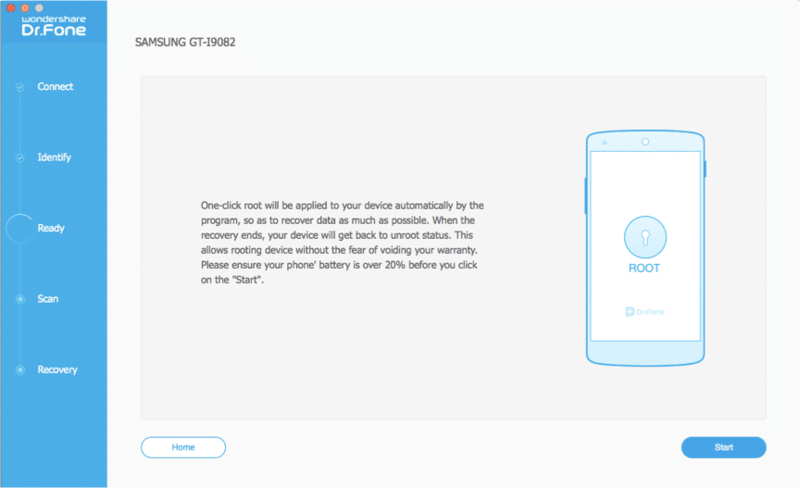 After a couple of preliminary tests to match device model and analyze the data, Dr. Fone for Android will start scanning the device for the file types you chose. Depending on the type of files, scanning mode and your device capacity, scan time can last anywhere between 45 minutes and 2 hours. When you feel that the scan is complete, preview for the recoverable files is accessible. For recovering the files, press Recover. After deciding the location and the name of the folder to which data ought to be recovered, press Save. Now the program will start recovering the files. This will take only around a minute or two for completion. After recovery process is completed, you can find the relevant folder through Finder and see for yourself that Dr. Fone did its magic! 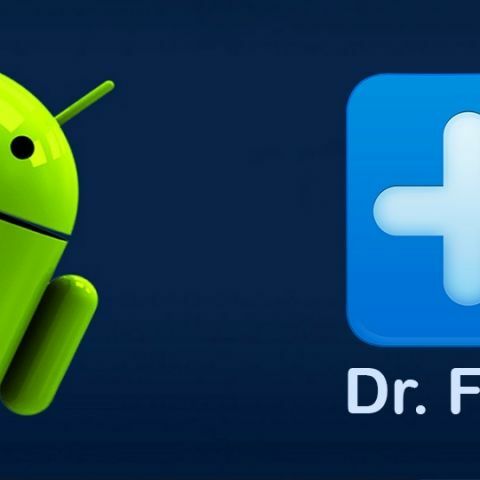 Dr. Fone for Android is an amazing application that promises a lot in terms of data recovery and manages to deliver on the same. 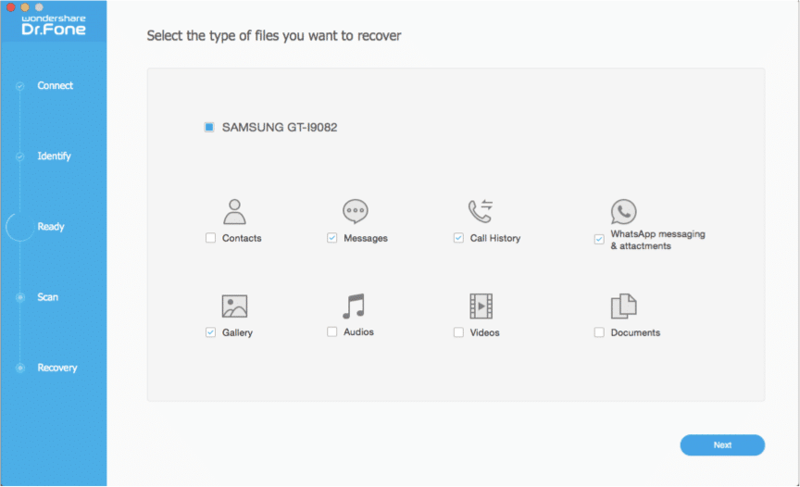 Given the ease with which we could use the tool, Wondershare’s Data Recovery suite is the logical choice for anyone who ever wants to recover deleted files. Can I back up the data which is removed from Recycle bin as well? from where my internet provider gets internet data for himself ? Which is the best application from android? 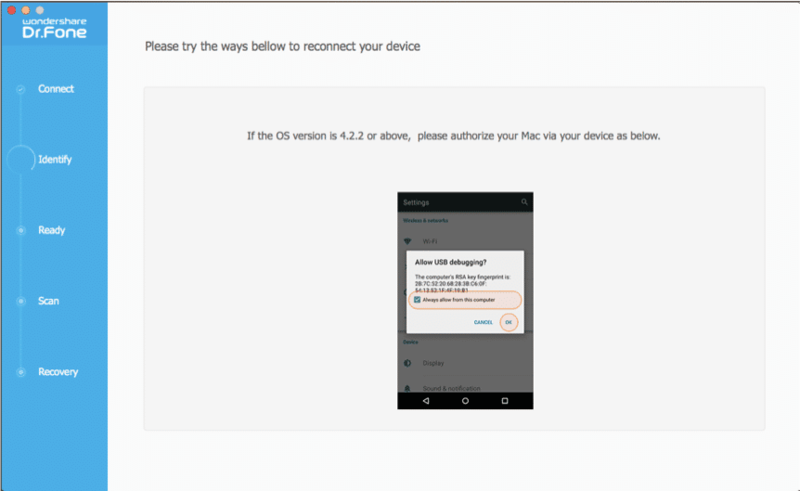 Can rooting Android disable international data roaming? 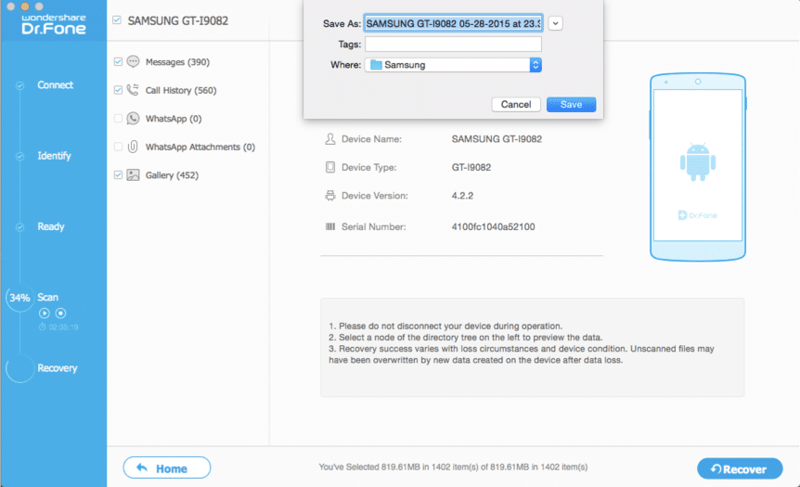 What is the easier and faster data recovery procedure from a corrupt hdd ? ?